This ravishing polychrome wax relief is an interesting example of the great Southern Italy tradition of wax modelling – especially Sicilian – developed along the 17th and 18th Century, well-documented through the works of several artists including the famous Abbot Gaetano Giulio Zumbo. 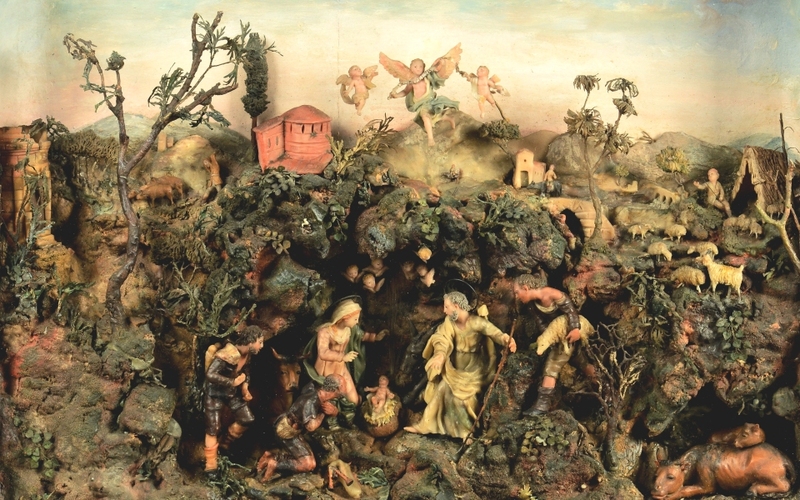 The theme of the relief here presented is the traditional Adoration of the Shepherds: within a rocky landscape, enriched by architectural and naturalistic motifs, we can admire the Virgin Mary and St. Joseph standing in a cave, kneeling in the typical gesture of presenting the Child Jesus to a group of people who came from different places to worship him. The upper part of the composition is a beautiful blue sky hosting three dancing cherubs holding a scroll bearing the inscription: IN EXCELSIS. Our relief can be compared to other similar works housed in private and public collections (see: ‘Mondi in miniatura – Le Cere artistiche nella Sicilia del Settecento’ by S. Grasso e M.C. Gulisano, Flaccovio Editore) as for example the relief depicting St. Teresa of Avila with the vision of St. Peter of Alcantara preserved in the Abbey of San Martino delle Scale in Palermo, close to our work for the characteristic presence of the dancing cherubs animating the scene. 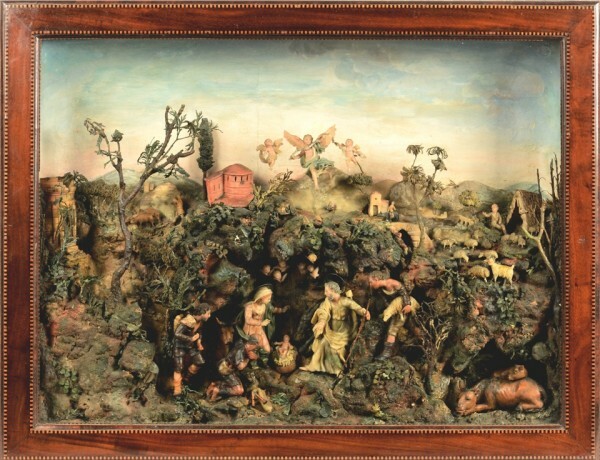 Considering the high quality of its framing – inlaid with precious woods – and that is designed as a wall decoration, it is very likely that this Adoration of the Shepherds was commissioned by a noble family that, according to an ancient tradition, likes to exhibit in the house a sign of devotion during the Christmas holiday season.